Say hello to the easiest and yummiest Keto dessert ever! This chocolate avocado mousse is just so silky and creamy and chocolatey that it’s actually hard to believe it’s also super healthy. Traditional chocolate mousse is made with whipped egg whites, chocolate and plenty of sugar. Because many people are worried about raw egg, the other option is to use whipped cream instead of the egg whites. 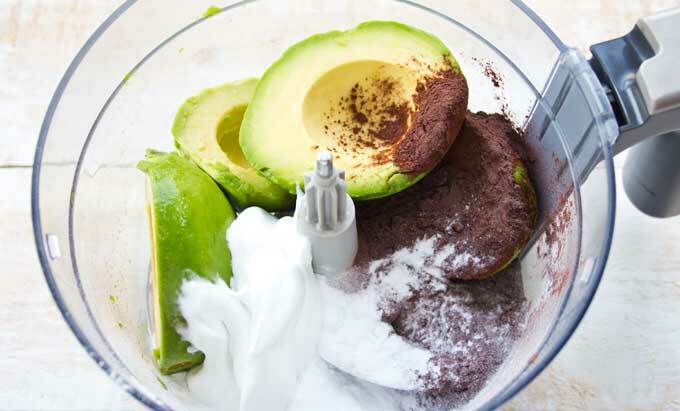 Using avocado in place of the egg or cream works incredibly well. It provides the same creaminess, but with the added benefit of heart-healthy fats, folate and carotenoids. My daughter is always sceptical when it comes to new healthy food recipes. 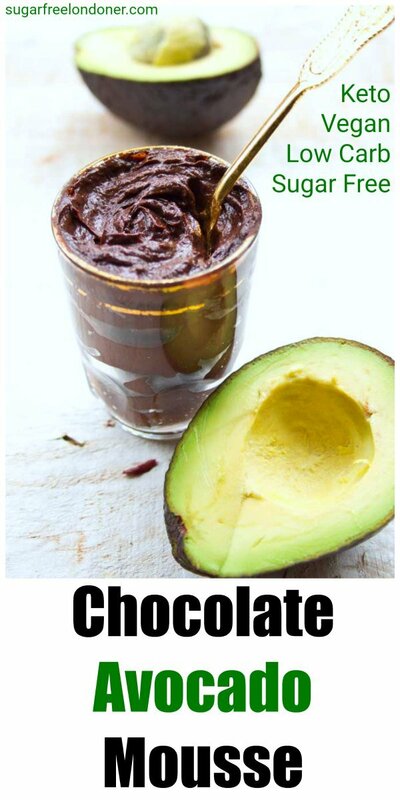 “What does chocolate avocado mousse taste like? Does it taste….. of avocado?” she asked. She tasted a spoonful – and loved it. The answer to her question? A sound NO! Because of the strong chocolate taste of the cocoa powder you cannot detect the avocado taste at all. This recipe really is a win-win on all fronts. 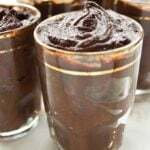 My original chocolate avocado pudding recipe from 2 1/2 years ago, one of the first posts on this blog, contained one banana. Whilst one sixth of a banana per portion is not a lot, it still contains sugar that can be avoided without losing out on taste. Therefore, I decided it was time to re-write this recipe to make it more suitable for low carb and Keto diets. Are you ready? 1.) 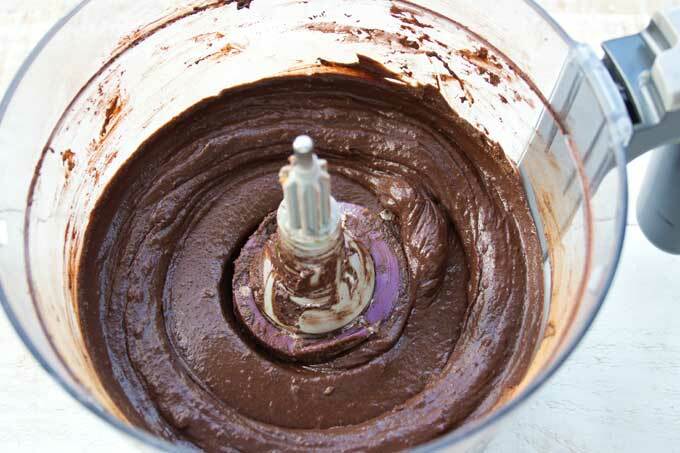 Put all ingredients for your chocolate avocado pudding in a food processor or blender. 2.) Blend until you have a really smooth mousse. That’s it, folks! Avocados: Make sure they are good quality and ripe. I recommend buying them ripe and ready in the shop – those ripen-at-home ones tend to go from hard to mouldy. Hass avocados are the best (though not cheap). Chocolate: You can use either cocoa or cacao powder in this recipe – just make sure it is unsweetened. Cacao powder has a milder taste as it is not roasted, so you might need a little more of it. Sweetener: Powdered sweetener works best in this recipe. You don’t want to end up with a crunchy mousse! If you only have granular sweetener to hand, blend it in your food processor or with the attachment of a stick blender until it is powdered. You could also use stevia drops if you prefer. Coconut Cream: If you cannot source coconut cream in a tin, buy a can of coconut milk and cool it in the fridge overnight. This causes the cream and the liquid to separate. The next day spoon out the coconut cream for your chocolate avocado mousse and use the leftover liquid for your next smoothie or curry. Spices: I love the flavour of cinnamon and nutmeg in chocolate. I first tasted it when I made these Mexican Chocolate Fudgesicles! However, they are not absolutely essential. You could also use mixed spice / pumpkin spice or even a glug of Brandy! It’s really important to blend your avocado mousse until it is super silky and smooth. If you don’t have a food processor or a power blender, simply take your time. You don’t want to find any green bits! Can you freeze chocolate avocado mousse? Absolutely! You can store the pudding in the fridge for a few days or simply put it in an ice cube tray and freeze it. When you’re ready to eat it, either defrost it of throw the cubes straight into a power blender and enjoy half-frozen! It’ll taste a little like my chocolate avocado ice cream! 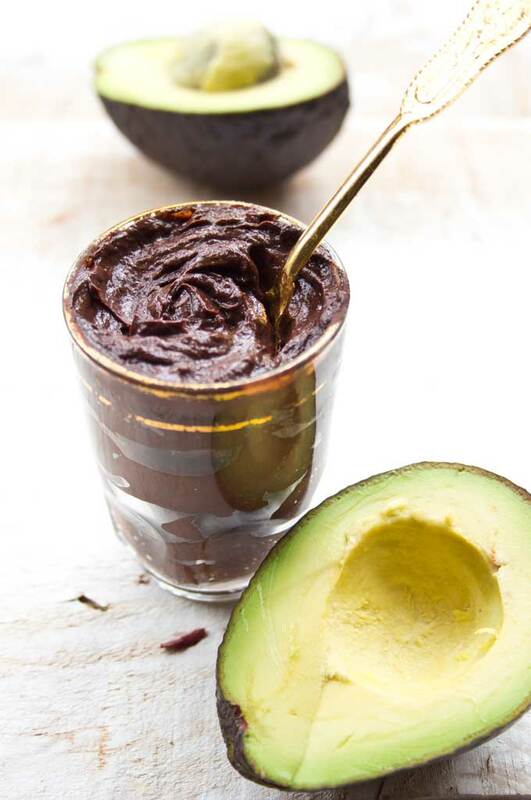 Creamy, thick and super simple chocolate avocado mousse - the ultimate healthy Keto dessert. 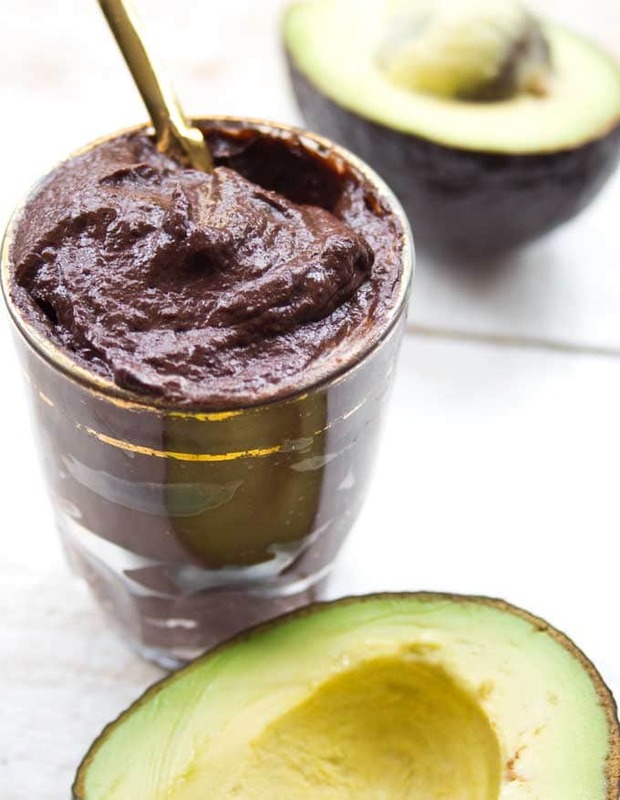 Try this sugar free and vegan chocolate avocado pudding packed with nutrients! Add all ingredients into a food processor and blend until creamy and smooth. Divide between 6 shot glasses or small serving bowls and chill until ready to serve. The cinnamon, nutmeg and vanilla extract are not essential, but make the pudding taste better. Make sure you use really ripe avocados and blend the mousse until it is very smooth. For a boozy pudding add a tablespoon of Brandy. 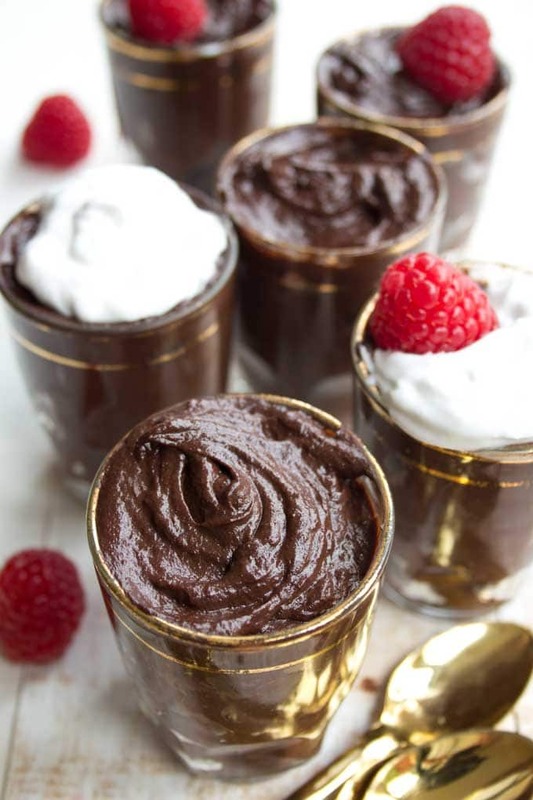 You can decorate your chocolate avocado mousse with a spoonful of whipped coconut cream (sweeten it with a bit of powdered sweetener) and berries or grated dark chocolate. This post was first published in March 2016. It was updated with new images and a recipe change in October 2018 to reflect how we make this recipe today. Great! It is filling indeed, you’re right about that 🙂 Glad you like it! Can I use powdered Monkfruit? And would it be the same amount if using powdered Monkfruit? I have never used pure powdered monkfruit, so I can’t advise on what quantity. If you mean a monkfruit/erythritol mix such as Lakanto, it would be a 1:1 replacement. But as long as you can stir it in, it should work! A glug of rum in this recipe sounds like a great idea! That sounds like a wonderful breakfast!!!!! This came out delicious, chocolatey and rich! I used heavy cream instead of coconut cream because that’s what I had at home. Also because I used a smoothie blender/bullet I used a little more cream to help with blending. In any case this recipe was a hit tonight. This recipe is simply awesome. So easy and fast to make and the result is absolutely delicious. You won’t miss real mousse when you eat this. When I made it and first tried it, the coconut cream flavor came out above the other flavors, but after refrigerating it overnight it reduced and then you get this very balanced silky dark chocolate, nutmeg, cinnamon, coconut combo which is lovely! Will be making this recipe for years to come, thank you so much! I’m allergic to coconut. Can I substitute heavy cream? This recipe is delicious and so simple. The mousse is just amazing, so creamy! It’s definitely one of my new favourites. Isn’t it amazing how many delicious things we can make from natural foods? Indeed. And they ALWAYS taste better than the stuff that’s in the shops!